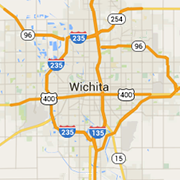 Looking for a Wichita bakery? Check out these local bakers for wedding and birthday cakes, muffins, cookies, fresh bread and other tasty treats. Sweetly Scrumptious, a boutique bakery in Wichita's Normandie Center, specializes in gourmet cupcakes, cake balls, & cookies. Nestled in the heart of Delano, baked goods made fresh daily. Serving cupcakes, cookies, cake pops, candy apples, various dessert items and cakes upon request.